Debunkers soon decided the woman in the clip was likely holding a portable hearing-aid or “ear trumpet.” Nevertheless, fans of science fiction (myself included) found the possibility fascinating, and the YouTube video has been viewed over six million times. Skip ahead to February of 2015. I began working on a book about the history of the town where I live, Fargo, North Dakota. I purchased a set of photos on eBay, taken by an unknown photographer, that depicted the aftermath of the 1957 Fargo Tornado — a powerful storm studied by Ted Fujita which contributed to the development of the Fujita Scale (now known as the Enhanced Fujita Scale). The 1957 Fargo tornado holds an important place in history for that reason, and was later given the rating of F5, the most powerful rating a tornado can receive. When the photos arrived, I was surprised by how small they were. They were tiny silver gelatin black and white prints, just 2 inches by 3 inches. I scanned them at high resolution for my book, cleaning and enlarging them in the process. As I looked at the photos, I noticed an interesting thing in one of them–a gentleman standing next to his car in the midst of a tornado-devastated neighborhood, with a small dark object in his hand. His posture is much the same as a person looking at a smart phone. The science fiction fan in me found it intriguing that I had discovered this image in the batch of photos. What was he holding in his hand? He appears to be looking at the device the same way a person would look at a smartphone. The skeptic in me accepted the likely explanation that this gentleman was holding a transistor radio, listening to news reports in the aftermath of a devastating and deadly storm. But, his car would have a radio in it, right? Skip ahead again, to December of 2015. In continuing work on my book about Fargo, I discovered another photo with a person doing something interesting. This photo is outside the old Shanley High School in North Fargo, which was severely damaged in the tornado. Two women can be seen in the photo–one woman in the foreground, looking at the unknown photographer, and a woman in the background who appears to be holding something to her ear. What is the lady behind the car holding to her ear? What are the odds that I would discover two photos like this in the same batch of photos, taken by the same photographer? Again, the skeptic in me explains it in one of several ways. In her right hand she’s holding a transistor radio, and her left hand is pressing an earphone (what the kids call an “earbud” these days) into her ear. Or maybe she’s holding a camera in her right hand, and her left hand is simply shooing a fly, or fixing her hair. Is it possible observers from the future visited Fargo in 1957, perhaps to witness a historically significant storm event? Did they have devices similar to our phones which could somehow function in the absence of cell towers? Jeff Daniels made a movie in the 90s with a similar plot [The Grand Tour, also known as Timescape] and Stephen King’s 11/22/63 is of a similar idea. Nah. That can’t be… right? What do you think? Leave a comment. The “cellphone” that you claim the man is looking at, is nothing more than a keyholder. My dad, in Fargo, always carried his keys on one. 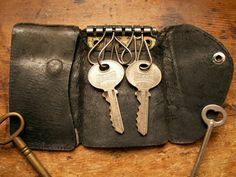 It was a small folded-over piece of leather, smaller than a wallet, that you opened… and inside were your keys, all in a row. The man in the photo is probably looking at it because he’s about to pull his car key out of it, to drive the car away. They were very common for that era, and many were sold in Fargo. So no, that probably wasn’t a time traveler at this 1995 Tyson fight. But if time travel does become possible everyone knows that you should bring rock and roll back to the early 1950s and hoverboards back to the Wild West .